Financial technology (FinTech) is the use of modern technology, such as the internet and apps (downloadable mobile software), to develop powerful financial services tools for consumers and businesses. For those who are motivated to improve their finances and dedicated to working toward their goals, FinTech can make the process more convenient, efficient and even rewarding. This guide will introduce you to the types of FinTech tools available and how they can help you. It will also tell you what to consider when choosing an app and how to stay safe when using FinTech. 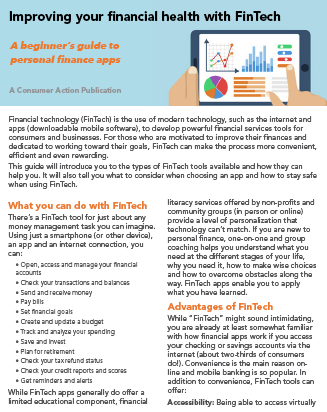 While FinTech apps generally do offer a limited educational component, financial literacy services offered by non-profits and community groups (in person or online) provide a level of personalization that technology can’t match. If you are new to personal finance, one-on-one and group coaching helps you understand what you need at the different stages of your life, why you need it, how to make wise choices and how to overcome obstacles along the way. FinTech apps enable you to apply what you have learned. Accessibility: Being able to access virtually any financial tool or account from your smartphone opens up a whole new world of choices, particularly if you live in a rural or underserved area or are homebound. Savings: Among other things, FinTech tools can help you avoid costs such as non-sufficient funds (NSF) fees by sending you a "low balance" alert, or make it possible to transfer money (even internationally) free or for a reduced fee. Mobile banking saves you the cost of traveling to the branch to deposit a check. Automation: Putting financial tasks on "autopilot" can help you avoid late payment fees and build up your savings faster (by automatically moving money into your savings account). Compatibility: If you will be using the tool on your phone or tablet (rather than accessing it on a website), find out if the app is available for iOS (Apple) or Android (Google). (Many are available for both systems.) Check the app developer’s website, or visit the Apple App Store or Google Play Store. Features: List your priorities and then narrow your options. For example, if you need the tool to integrate with ("talk to") your bank accounts or other apps, then check that first. If you want it to also pay you a reward when you reach a goal, look for that next. If you have a number of priorities, you might not find an app that meets all of them, but try to get as close as possible. Cost: Many apps are free. Some charge a one-time fee during download. Others charge a monthly fee, or fees based on activity—for example, a transaction fee if you wire money overseas or a "low balance" fee if your balance drops below a certain level. Still others make money off of advertising or "partnerships"—something you should be aware of before trusting a product "recommendation" or jumping on an offer to apply for a particular credit card. Satisfaction/ratings: Before downloading an app, read reviews to make sure the developer is legitimate and users are satisfied. "Google" the name of the app along with the word "reviews" or "ratings" to find industry reviews (by companies such as CNET, PCMag.com and TechCrunch) and, in some cases, individual user reviews. If you have a financial account, the financial institution almost certainly offers an app for accessing it. Banking apps can be helpful and easy to use, but their functionality is limited. NerdWallet’s "Best Budget Apps and Personal Finance Tools for 2018"
PCMag.com’s "Best Personal Finance Services of 2018"
Tom’s Guide’s "Best Budgeting and Personal Finance Apps (of 2018)"
Every type of technology—including the internet and apps—presents risks. But following these simple yet effective "dos and don’ts" will go a long way toward protecting your privacy, personal data and account security. Do verify the legitimacy of an app before downloading to avoid malware (malicious software that can steal, corrupt or lock your data) and unauthorized charges. Don’t let your browser or device save login information if given that option. Do log out of your account and/or app (extremely important if you use a public computer or shared device to access your accounts). Do promptly install operating system updates that fix security issues. Do turn on features or install apps that can locate, lock or erase your device remotely in case it is lost or stolen. This guide was created by Consumer Action with the support of the Financial Solutions Lab, managed by the Center for Financial Services Innovation with founding Lab partner JPMorgan Chase & Co.